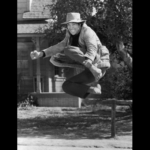 Actor David Carradine was working on the TV Show Kung Fu the Legend Continues with Shifu Marquez as an assistant choreographer under Shifu Rob Moses who was David’s main trainer. 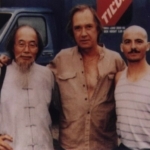 Shifu Marquez got to stunt double David Carradine and helped him in his training for the show. To the left is Mr. Kim Chan what a great guy he was and his part was the Ancient One. 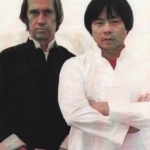 Now this is when Grandmaster Kam Yuen was training David Carradine in the beginning of the original series Kung Fu TV show.